The all-new seasons of Oggy and the Cockroaches is ready to return to Cartoon Network.Turner’s other channel, Cartoon Network, will air new seasons of ‘Oggy and the Cockroaches’ from 14 August, Monday-Friday at 6 pm. The new season dives into history, taking fans across the globe and showing them that the skirmishes and attacks between them have been eternal! Our hero runs into icons that changed the course of history, such as Caesar, Leonardo da Vinci and even Napoleon. The new season also brings an exciting mix of brand new stories and some classic chases that are sure to entertain fans and have them in splits. Featuring the usual favorites that make the show rip-roaringly funny, Jack and Olivia, the seasons are packed with delightful scenarios with Roman chariots, Egyptians pyramids and more! 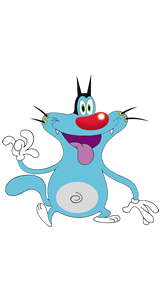 OGGY is a big blue easy-going Tom… well, that's how he'd describe himself. A sensitive cat with a kind heart : a "good guy". Only one thing this cat is after : a quiet snooze, curled up on his pink cushion in front of his favourite mind-numbing TV programs. He adores game shows, fantasising about the day he'll win a self-cleaning oven, or 12 gear vacuum cleaner on "The Wheel of Fortune"… OGGY, an Ideal Home fan, is a natty housekeeper. 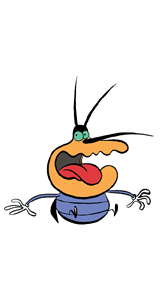 JOEY is the roaches'' true leader. He's selfish, mean, vicious, cynical and horribly sadistic… He's the boss. 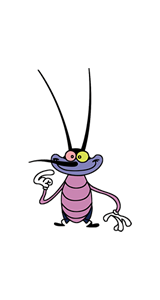 If he could talk, he'd make us a stirring speech about the destiny of the cockroach civilisation. His ultimate goal is to take over the entire household. His mind is a boundless source of new strategies to achieve those ends. 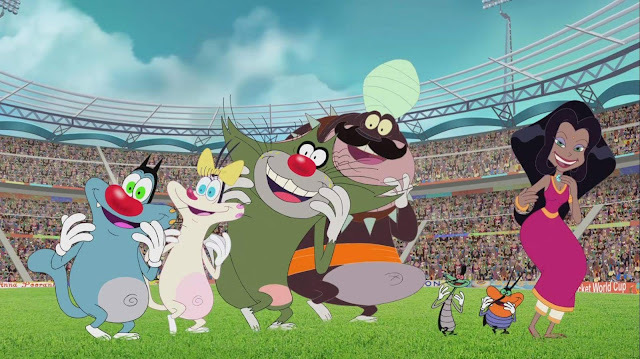 One thing is clear : JOEY hates OGGY. One thing you can say about JACK, he's not given over to self-doubt. As keyed up as an over-wound alarm clock, JACK is quick to take affront. What's more, he suffers from abnormally high blood pressure. In other words, he could explode at any moment. DEEDEE is the Belly. Fat, obese, and monstrously lazy . One thing only matters to this roach : stuffing his face. He's OBSESSED with eating.. 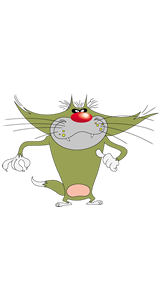 He and OGGY share the same tastes. In fact that is one of the reasons they despise each other. Long tall skinny MARKY is second in command. Not exactly gorgeous, although he is reputed for past success in that domain.